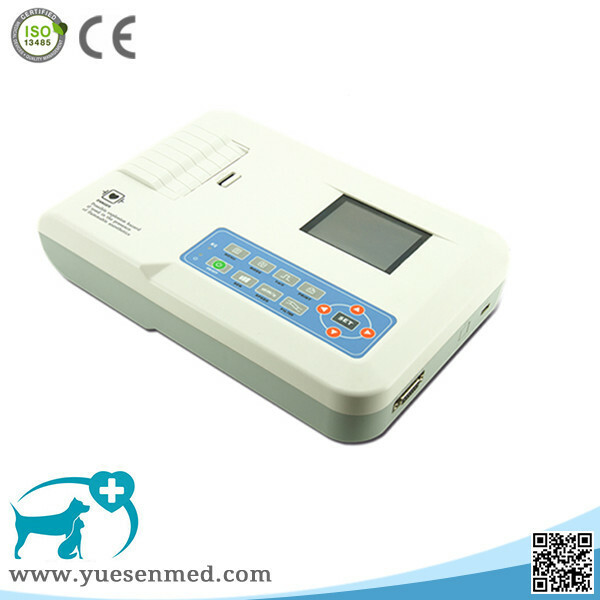 YSECG300GV is a three channel electrocardiograph sampling ECG signals simultaneously and printing ECG waveform with thermal printing system, which features in, record and display ECG waveform in manual or auto-mode, promptings for “Lead off” and “Lack of paper”, multiple languages interface, support both AC and DC for power supply, optional rhythm lead that convenient for abnormal heart rate observation, case database management, etc. Sync sampling, digital signal processor, gets better quality ECG waveform by ECG signals filtering through the power frequency filter, baseline filter and EMG filter. Display 3/6/12-lead ECG waveform, and states of print mode, sensitivity, paper speed, filter, etc. in one screen, convenient for contrastively diagnosing. Multi-print mode and format: manual and automatic 4×3, auto 3×4+1, auto 3×4, auto 2×6+1, auto 2×6, auto 3-2+1, auto 3-2, auto 1x12+1, auto 1x12, rhythm 4, rhythm 3 and rhythm2, etc. Waveform length can be adjusted and timing print function is available, which meets the need of different applications. Built-in high-capacity memorizer can store up to 1000 cases, which is convenient for doctor’s review and statistic. The interface languages including: Chinese, English, Spanish, Turkish, Polish, Italian, French, German, Portuguese, Kazak Tili, Russian, Ukrainian, Serbian and Slovenian. Also the reports can be printed in all languages above.